Principal Deputy Assistant Secretary for Manufacturing and Services Maureen Smith speaks at a press conference on the MDCP award to World Trade Center Buffalo Niagra to increase exports by the U.S. medical devices industry. Photo courtesy Nancy J. Parisi. Last week I was in Buffalo, New York, along with Congresswoman Kathy Hochul (NY-26), to present the World Trade Center Buffalo Niagara (WTCBN) with an award of nearly $220,000 to increase exports by the U.S. medical devices industry. We expect that these funds will generate about $25.5 million in New York exports over the next three years. 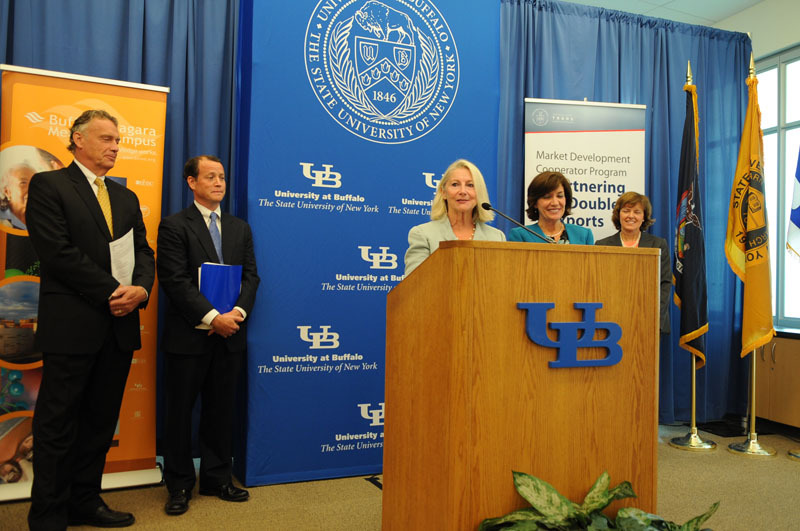 The award will fund a program that will be administered over three years by WTCBN with the support of partners who work closely with local medical-device companies, among them University at Buffalo’s New York State Center of Excellence in Bioinformatics and Life Sciences, the Buffalo Niagara Medical Campus, the Buffalo Niagara Partnership, MedTech, the Jacobs Institute and the Department of Commerce. It was especially gratifying to me to see the wide-ranging community effort behind this award. Chris Johnston, president of the WTCBN is an ITA alum and he has made this export effort an integral part of Buffalo’s push to reinvent itself as a center of excellence in the medical device industry. The astonishing new incubation center at the Jacobs Institute will have facilities for computer simulated surgery and prototype production right in the hospital. While I was there, we witnessed a stroke victim brought into the hospital and the obstruction in his artery removed—in 13 minutes. The award is part of a larger, $2.4 million fund. Eight other non-profit industry groups around the country are also receiving awards from this fund. In total, the awardees have estimated that the funds will generate about $971 million in U.S. exports in the next three years. The Market Development Cooperator Program (MDCP) awards include financial and technical assistance from the U.S. Commerce Department’s International Trade Administration (ITA) to support well-defined business plans aimed at increasing exports and U.S. competitiveness within certain industries. An MDCP award establishes a partnership between ITA and nonprofit industry groups to help strengthen global competitiveness and create jobs through exports. Since MDCP’s inception in 1993, the program has issued 121 awards. In an average year, MDCP projects generate $372 million in U.S. exports.